New test results from AAA reveal that automatic emergency braking systems -- the safety technology that will soon be standard equipment on 99 percent of vehicles -- vary widely in design and performance. All the systems tested by AAA are designed to apply the brakes when a driver fails to engage. However, those that are designed to prevent crashes reduced vehicle speeds by nearly twice that of those designed to slow the car enough to lessen crash severity. 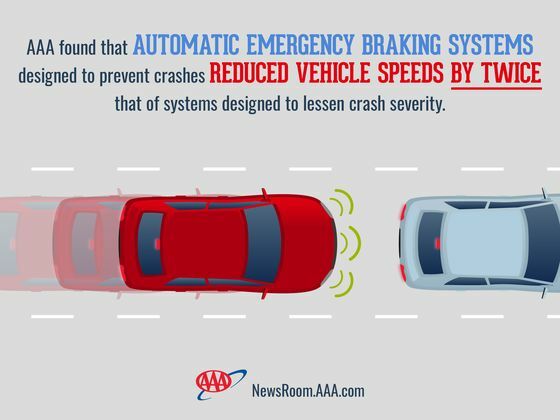 While any reduction in speed offers a significant safety benefit to drivers, AAA warns that automatic braking systems are not all designed to prevent collisions and urges consumers to fully understand system limitations before getting behind the wheel. In partnership with the Automobile Club of Southern California’s Automotive Research Center, AAA evaluated five 2016 model-year vehicles equipped with automatic emergency braking systems for performance within system limitations and in real-world driving scenarios that were designed to push the technology’s limits. Systems were tested and compared based on the capabilities and limitations stated in the owner’s manuals and grouped into two categories -- those designed to slow or stop the vehicle enough to prevent crashes, and those designed to slow the vehicle to lessen crash severity. • In terms of overall speed reduction, the systems designed to prevent crashes reduced vehicle speeds by twice that of systems that are designed to only lessen crash severity (79 percent speed reduction vs. 40 percent speed reduction). • With speed differentials of under 30 mph, systems designed to prevent crashes successfully avoided collisions in 60 percent of test scenarios. • Surprisingly, the systems designed to only lessen crash severity were able to completely avoid crashes in nearly one-third (33 percent) of test scenarios. • When pushed beyond stated system limitations and proposed federal requirements, the variation among systems became more pronounced. • When traveling at 45 mph and approaching a static vehicle, the systems designed to prevent crashes reduced speeds by 74 percent overall and avoided crashes in 40 percent of scenarios. In contrast, systems designed to lessen crash severity were only able to reduce vehicle speed by 9 percent overall. • Nine percent of U.S. drivers currently have automatic emergency braking on their vehicle. • Nearly 40 percent of U.S. drivers want automatic emergency braking on their next vehicle. • Men are more likely to want an automatic emergency braking system in their next vehicle (42 percent) than female drivers (35 percent). • Two out of five U.S. drivers trust automatic emergency braking to work. • Drivers who currently own a vehicle equipped with automatic emergency braking system are more likely to trust it to work (71 percent) compared to drivers that have not experienced the technology (41 percent). For its potential to reduce crash severity, 22 automakers representing 99 percent of vehicle sales have committed to making automatic emergency braking systems standard on all new vehicles by 2022. The U.S. Department of Transportation said this voluntary agreement will make the safety feature available on new cars up to three years sooner than could be achieved through the formal regulatory process. According to the National Highway Traffic Safety Administration, rear-end collisions, which automatic emergency braking systems are designed to mitigate, result in nearly 2,000 fatalities and more than 500,000 injuries annually. Currently, 10 percent of new vehicles have automatic emergency braking as standard equipment, and more than half of new vehicles offer the feature as an option. North America’s largest motoring and leisure travel organization, AAA provides more than 54 million members with travel, insurance, financial, and automotive-related services. Operating 18 offices throughout Maine, New Hampshire and Vermont, AAA Northern New England is a not-for-profit, fully tax-paying corporation and serves as an advocate for the safety and security of all travelers. AAA Northern New England can be visited on the Internet at www.AAA.com.